Before I tell you the latest story, I have to give you some background. Mom has a bit of a paranoia streak in her. If anyone implies that she is the cause of something, no matter how inconsequential, she thinks you are picking on her. I've written about this before. She currently has sores on her nose and forehead. It starts with a bit of dry skin and then she scratches and picks it into a sore. If you tell her to stop when she's picking, she gets angry. Mom: How come I have these sores on my face? Me/The Aide: Because you scratch at them when you aren't thinking about it. Mom: [Angry.] Why is everything always my fault? It didn't take too many times for this to happen in order for me to learn that the best response is to shrug my shoulders when she asks. When the spots get really irritated, I put Neosporin anti-bacterial ointment on and cover them up with a band-aid. But that isn't the story I'd planned on telling here. You just have to know that's her mindset before I get to the good one. Okay, so we were watching a professional NBA basketball game on television last night. I'm a huge fan and mom likes it, too. 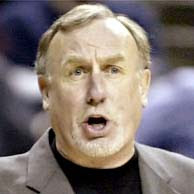 After a controversial play, coach Rick Adelman leaps from the bench and starts yelling at the referees. Adelman turns and it appears as though he is looking directly into the camera and shouting. Our television is a rather large flat panel and mother dear thinks he is looking right at her and going to blame her for why he's angry. Mom: [Defensively, to avoid blame.] Don't look at me! My mom was always "being picked on" too. Funny how defensive they get. Somedays she would get into quite a snit and go sulk in another room. You're right - the best possible way to handle is to shrug!